The first six digits from a credit card number is also known as the bank identification number (bin). The number between the bank identification number and the check digit is the customer account number. 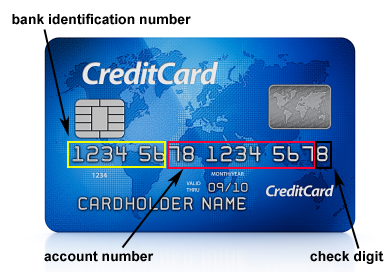 The last digit is the check digit and is added to validate the authenticity of the credit card number (based on the Luhn algorithm). The information provided are not guaranteed to be correct, as they may not be current and, although the information is provided in good faith, Mobilefish.com is not in a position to check its validity.